PC Hardware refresh is a frequently overlooked aspect of IT workflow and of IT costs. Migration costs are indeed difficult to quantify. Even when they are quantified, CIOs may feel that migration complexity is inevitable – and that so are the costs. The purpose of this analysis is to present a clearer picture of an enterprise migration process from the costs perspective, and suggest possible ways for cost reduction. We will first explore the components of a typical migration process, including compatibility aspects. Then, we will examine three common migration scenarios, providing cost analysis on per-user basis. As the report shows, manual migration, or migration with built-in system management tools only - does not provide a fully unattended and complete transfer. Tools such as the Zinstall Migration Suite have been developed specifically to facilitate and automate the process and reduce its cost. Zinstall Migration Suite does not just make the upgrade process unattended and automatic – its fundamental benefits stem from a complete, comprehensive and fully accurate transfer of user personalization. This means that user rejection risk is minimized, along with training times, re-configuration and support requirements. 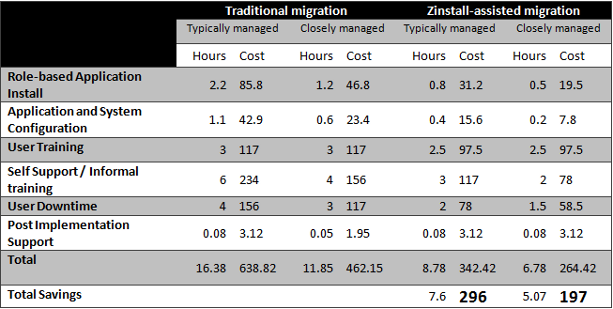 For each migration scenario below, we will evaluate that impact of using the Zinstall Migration Suite on different migration tasks – and the total savings in time and cost.